Morgantown, W.Va. – Many West Virginia University students have busy lives, balancing their studies, social activities and family obligations. However, for one student, in addition to all that, there’s 960,000 employees dependent on him to maintain maximum efficiency in his business. The employees? Well, they’re honeybees, and not only is his profit margin at stake, but also an increasingly critical part of ecology — pollination. Byrd, the owner of Byrd’s and Bee’s Honey and a wildlife and fisheries resources major at the WVU Davis College of Agriculture, Natural Resources and Design, said he’s always been fascinated by wildlife, and recounted running around his yard as kid with a bug net. He previously raised tilapia and mealworms, and once owned a colony of Madagascar hissing cockroaches growing up. “Yeah, I know that growing up I probably pushed my parents to the limit by bringing all sorts of wildlife home,” he joked. 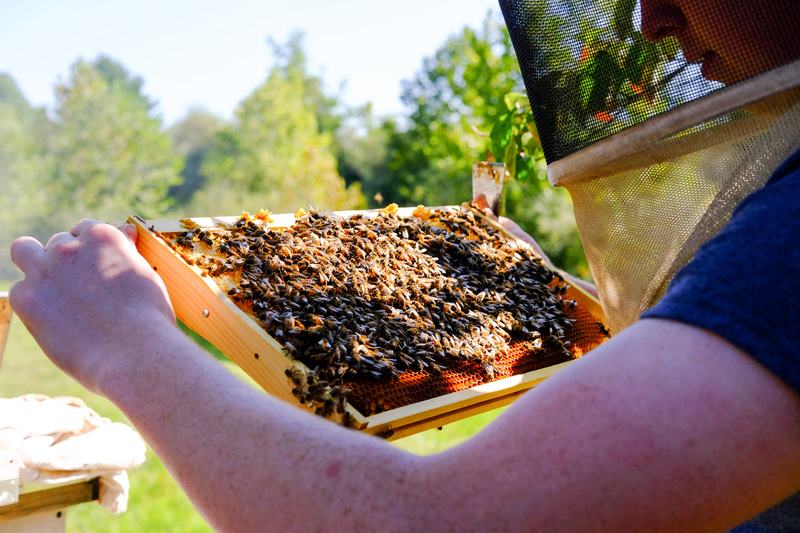 But, the dream of beekeeping was sparked by a Facebook post from the WVU Extension Service Ritchie County office. It advertised a beginning beekeeper course offered at the local 4-H campgrounds, and at that time, Byrd was an ambitious junior in high school with an entrepreneurial spirit. The timing couldn’t have been more perfect. One of the strengths of the WVU Extension Service is the ability to share research-based knowledge to West Virginians with programs and offices in all 55 counties. The information is sound and trustworthy, and in the agricultural realm, producers or aspiring producers can take it and use it to improve their operations. 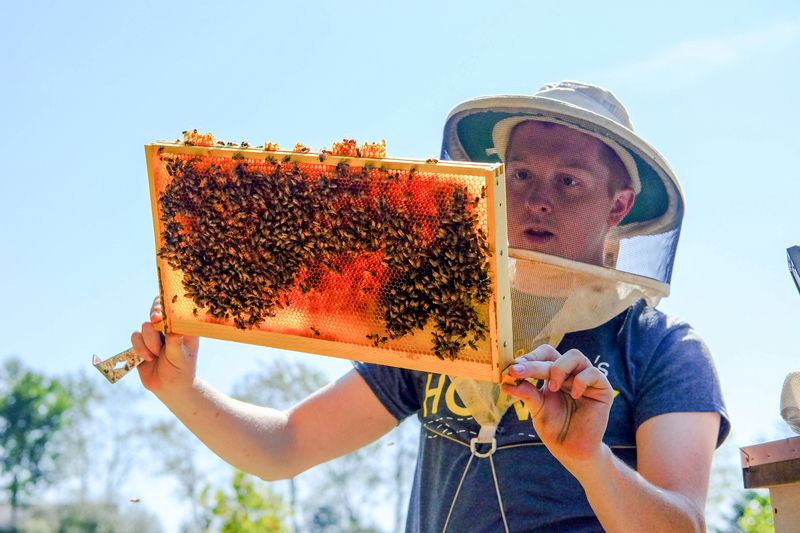 For Byrd, it provided a stable footing to build his business on as he learned the proper ins and outs of becoming a beekeeper thanks in part to WVU Extension Service Clay County Agent, Michael Shamblin who taught the classes. Once the classes were concluded, Byrd learned enough to start the venture that year, and before he entered his senior year of high school, he had three healthy hives after he got the growing pains out of the way, both figuratively and literally in the case of learning to weather multiple bee stings. When he came to campus his freshman year, Byrd was met with a familiar face, the former agriculture teacher from his high school had taken a position at WVU and introduced him to the WVU LaunchLab, the University’s free startup resource center that helps entrepreneurial students develop new companies and products. The unit is part of the WVU Innovation, Design and Entrepreneurship Applied Ecosystem, a university-wide web of centers, offices and programs that fosters and supports innovation and entrepreneurship among WVU students, faculty and staff while engaging the statewide community. Byrd recounts a simple question that the director at the time asked him that brought it all in perspective — if you’re already selling honey, why not make a business out of it? He was hooked. Byrd registered for another class during his first semester at WVU and found himself developing his entrepreneurial skills, including the brass tacks of budgeting, projecting sales and revenue, refining his business pitch and developing a comprehensive business plan. To help craft the business plan, another WVU academic unit came into play as Byrd was paired with Katie Cook, a master’s student at the WVU Davis College of Agriculture, Natural Resources and Design, who had unique insight as an agribusiness major in helping him carefully consider all financial aspects of his operation. The exercises didn’t prove fruitless. In fact, the business pitch helped him obtain $21,000 for his business so far in various business pitch competitions, including winning $10,000 as a sophomore in the West Virginia Collegiate Business Plan Competition hosted by the BrickStreet Center for Innovation and Entrepreneurship, which is housed in the WVU College of Business and Economics. The money has allowed him to reinvest in his business and plan for careful expansion, including a small building entirely devoted to processing honey in the near future. He also gives back to the community. He worked with Alex Straight, the WVU Extension Service Agriculture and Natural Resources agent in Ritchie County at the time, to take his exhibition hive to 4-H camps and participate in local agriculture field days. According to her, Byrd’s exhibition hive helps youths in the community make the connections to the importance of all forms of agriculture, including beekeeping, in a larger scope of why it’s important to society and the environment. “He’s great with the kids and they love being able to see a hive at work. It inspires some sense of wonder and curiosity, and it’s a lesson that really sticks with them because it’s tangible,” said Straight. Byrd also touted the experience as worthwhile as he hopes to inspire a few children to follow in his footsteps growing up — catching bugs and guessing about the way they fit into the ecosystem. When asked about his future, Byrd was decisive. But, it’s not all economically motivated. “Personally, I’m just really happy to see the bees coming back,” he said. Byrd’s and Bee’s Honey can be found on Facebook at https://www.facebook.com/ByrdsandBeesHoney/. To learn more about WVU Extension Service programs and classes, visit extension.wvu.edu or call your local office for the most complete information in your area. Follow the WVU Extension Service on Facebook and Twitter at @WVUExtension.